For anyone wanting to drink homemade citrus juices on a regular basis, a manual juicer take a lot of effort and time to use. By choosing the best electric citrus juicer, you can have your glass of fresh Vitamin C in just a few minutes and there will be hardly any waste. You’ll also appreciate the superior taste of freshly squeezed juice, be it grapefruit, orange, lemonade or even a little lime juice for the dish you just made. Here are some of the top rated electric citrus juicers available. Look for a juicer that is easy to use, clean and store. After all, while home made juice is healthier and tastier, store bought is pretty convenient. Juicing should not be painful on your arms and wrists even if you have lots of fruit to juice. It should extract the maximum amount of juice possible. A good feature to have in this case is the ability to reverse ream after you lift the peel momentarily and press down again. Keep in mind that these juicers are only for citrus fruits. You’ll need centrifugal juicers for non-citrus fruits and masticating juicers are preferable for vegetables. The following electric citrus juicer reviews should help you choose the best one for your needs. Best Citrus Juicer on the Market? … It’s a Tie! This innovative juicer lives up to its brand name. The KRUPS ZX7000 juicer is known to use one less orange to fill a glass, which equates to more juice for the dollar. The big 130 watt motor will give you plenty of power for any juicing need, but best of all, you can go either manual or automatic. The automatic function works by using the attached lever. You place your citrus fruit on the reamer, pull the lever down over it, the machine turns on and you get juice. That makes juicing incredibly easy, and even people with limited mobility in their hands will be able to grasp the lever and pull it down over their favorite citrus fruit. This is also great if you have to juice a lot of fruit. In manual mode, and just like every other juicer, you simply press the fruit onto the reamer to get the job done. Although the strainer is made to stay in place, it can be removed if you want pulp, or simply wait until you are done and dump the pulp into your glass. Except for the lever and lever pin, all the removable parts can be cleaned in a dishwasher. It has a heavy build so it won’t shift on the counter while working. There is a drawback using the automatic handle function to juice large fruits like grapefruit, but doing them manually is no problem. Also, the spout drips when you are done for a few seconds but you can just take a small cup and place it under the spout to catch the drippings. For another powerful citrus press that’s good for large quantity juicing, the Breville 800CPXL Citrus Press should be considered. Although this is the most expensive of the bunch, it has a commercial grade quality for long lasting use even if it’s used heavily. Even the reamer is made of brushed stainless steel. Its motor is rated 110 watts. A sensor activates spinning when the lever arm makes contact with the reamer and you can choose between two stainless steel filters to control the amount of pulp you like. The spout can be flipped up when juicing is done to prevent spills. The design of the spinning cone ensures citruses of all sizes are juiced fully. While the old version of this model had a few issues, they have been ironed out in the latest version. The only issue that crops up now is that the reamer cone is fragile. This is one of those juicers that looks as good as it works. And in a home setting, you want something that will be top quality as well as aesthetically pleasing too. 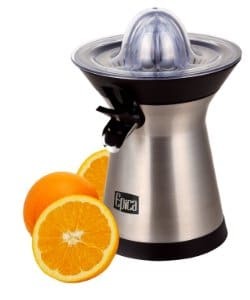 The Epica citrus juicer is a compact appliance with a small footprint, so you can store it out on the counter or in a cabinet. This highly rated juicer features a big but very quiet 70 watt motor for maximum speed and torque, which gives you more juice from any citrus fruit. That means top quality and value overall. Plus, it is one of the easiest juicers to use, as there is no switch to turn it on or off. All you have to do is push down on the reamer with the cut fruit and it starts. Better still, one of the top priorities in any home setting is ease when cleaning. To that end, there is no juicer that is better. Merely disassemble the 3 parts, including the reamer and the pulp catching screen, rinse under water or swish it around in a tub of dishwater, and you are done. It comes with two reamers, one large for grapefruits and oranges, and one small which makes this perfect for smaller fruits like limes and lemons. There is a high built-in spout that allows you to juice right into a glass even if it is a tall one, and a mesh strainer to keep the pulp out. You may not think you’ll get much of a juicer for less than 50 bucks, but this Cuisinart CCJ-500 Pulp Control Juicer delivers. Granted, it only has a 30 watt motor, but the reamer automatically reverses, which means you’ll still good juice yield with the power you have available. In fact, even the pulp that is still left on the reamer after you’ve juiced several fruits can be squeezed of every last drop. You do this by putting on the reamer cover and pressing down. This unit actually allows you to have pulp with your juice. You slide a simple lever to move the strainer out of the way, limiting the amount of pulp you want. It’s a neat idea in a budget priced juicer. Although there is no interchangeable reamer feature, it will still get maximum juice from the smallest limes to the largest grapefruit. It even comes with a pop-up spout for no drips too. But take caution with cleaning, you may need a fine brush to get in the cracks and the crevices, and this juicer may be a bit louder than most. If you like a unique design that will deliver the goods, the Tribest CitriStar is certainly one to consider. It may be available for less than $50, but it comes with a good sized 50 watt motor that will get your juicing jobs done easily. You’ll have to like pulp in your juice, because the screen lets a bit through with every citrus being juiced. But it does come with two reamers, one large and one small, so you’ll always be ready for any sized fruit. It is reasonably quiet for a juicer, regardless of price, and the side mounted spout allows you to place a glass, or the provided bowl, beneath it. The included bowl does not have a spout, so pouring may be a bit tricky, but if you just fill up a glass directly from the machine, then problem solved. The no-drip spout folds up, but there have been issues with pulp plugging the spout up when running. After several fruits that have been juiced, you may have to remove some pulp to prevent this occurrence. But it comes apart for easy cleaning and usually just a rinse and dry will do. You may think that such an inexpensive juicer might not give you maximum yield, but this 30 watt motor powered Black & Decker CJ625 unit can juice with the big boys. The secret is the automatic reversing reamer that extracts the most juice from any given citrus fruit. There are two sized reamers, one for small fruit and one for medium fruit, but if you are looking to juice grapefruits, you may be disappointed. This is the only juicer on the list that actually deposits the juice in a self-contained pitcher. Once finished juicing, you remove the pitcher from the base and pour into a cup. It even has an adjustable pulp control to let in as little, or a lot, of pulp. Of course, no juicer in this price range is going to work for huge batches of juice. It may overheat if used in that way, but for your morning cup of juice, for the price it’s hard to beat. Although it breaks down easily for cleaning, and all of the parts are dishwasher safe, the strainer is a two-part unit, so be aware that some pulp can get caught between the strainers and must be meticulously cleaned to avoid unseemly pulp residue.